VANCOUVER, British Columbia, Nov. 30, 2018 (GLOBE NEWSWIRE) -- Electra Meccanica Vehicles Corp. (NASDAQ: SOLO) (“Electra Meccanica” or the “Company”), a designer and manufacturer of electric vehicles, today announced that the Company is partnering with Dobson Motorsport, a leading collector car brokerage founded by the legendary racecar driver Dominic Dobson, to represent and promote the SOLO EV in Oregon and Washington State. Dominic Dobson (Dobson Motorsport) stands next to the Electra Meccanica SOLO electric vehicle. Dominic Dobson is a former professional racecar driver and widely respected authority within the automotive industry. Dominic’s automotive legacy includes 65 starts in IndyCar between 1984 and 1994, including 7 times in the Indianapolis 500. He has also competed in numerous leading sportscar races, such as the prestigious 24 Hours of Le Mans, the Baja 1000 and most recently won the Unlimited class at the Pike Peak International Hillclimb in his rookie year. Beyond motorsports, Mr. Dobson was an instructor at the Bob Bondurant Driving School and previously managed the Cavallino Collection, a multi-million dollar collection of historical automobiles. He was also the Chief Development Officer for America’s Car Museum in Tacoma, WA and currently owns Gerber Motorsport, a European automotive repair and restoration facility in Seattle. 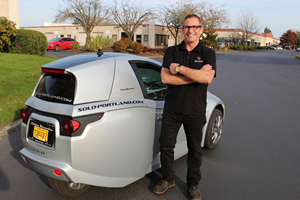 “I am truly excited to work with Electra Meccanica to promote their vehicles amongst key influencers and at high-value industry events within the Pacific Northwest automotive market,” said Dominic Dobson, Founder of Dobson Motorsport. “My personal experience with the SOLO has been incredibly positive, I have found the SOLO to be the ultimate commuter vehicle while remaining an absolute blast to drive, reminiscent of the Formula cars I raced as a teenager in Seattle. I look forward to working with the team at Electra Meccanica to spread awareness of their exhilarating new vehicle. To find out more information about reserving a SOLO in the Pacific Northwest, please visit www.solo-portland.com or www.solo-seattle.com. Dobson Motorsport has over 60 years of combined experience in all forms of automotive arts, from competition to collections, from restorations to repair. Dobson Motorsport brokers, buys and sells collector vehicles worldwide and also organizes a track day event called Speed Days. Dobson also owns Gerber Motorsport, a European automotive repair and restoration facility located in Seattle, WA. For more information visit DobsonMotorsport.com and GerberMotorsport.com. Electra Meccanica is a designer and manufacturer of electric vehicles. The Company builds the innovative, all-electric SOLO, a single passenger vehicle developed to revolutionize the way people commute, as well as the Tofino, an elegant high-performance two seater electric roadster sports car. Both vehicles are tuned for the ultimate driving experience while making your commute more efficient, cost-effective and environmentally friendly. Intermeccanica, a subsidiary of Electra Meccanica, has successfully been building high-end specialty cars for 59 years. For more information, visit www.electrameccanica.com.